The most common mistakes made at the regatta and how to turn them to your advantage. Cowes-based professional navigator and tactician Graham Sunderland explains the most common mistakes made at the regatta and tells you how to turn them to your advantage. Tidal curves are essential and can be found free on www.easytide.co.uk. These will help with calculating the rise over chart datum. Knowing when to push your luck is essential. Isle of Wight shores are rocky so they’re not the place to be yachting with 0.5m under the keel, while the mainland is sand or shingle so has a flatter, more consistent profile. Falling tides are also a bad time to push your luck, as you could be there for hours. You really should be hard-nosed when cheating the tide. Sailing into the tide for even a few metres is bound to cost you dearly. It’s important to make the inshore route yours – it may be hard work, but those who grow tired of repeated tacking will make big losses. Rather than duck a competitor, putting you into tide, consider tacking, then calling for water. 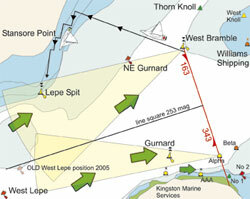 Cowes Week has quite a few navigation restrictions. Those most commonly broken include Black Group boats sailing south of Snowdon, SM and black inflatable Skandia. Make sure you mark up a chart to place in the cockpit as a reminder. Also, after your start, don’t pass between Alpha or Beta and Royal Yachting Squadron (RYS) flagstaff unless it’s your last leg to finish. A busy day on the water, tiredness, hunger and the smell of beer all make it easy to forget to sign off. It’s not so difficult now that you can do it online or by text, but give yourself a reminder. to make things worse, they now block you from tacking. Drop your kite early and focus on your rounding – wide in, tight out. Get it wrong and you will spend all day in last place with no hope of winning. The core issue is time. You have to make your decision, then motor before your preparatory signal (engine off at the gun) to the desired end. Remember, it can take five minutes to get from the middle of the line to one end. Getting out early to the start is essential. And watch the starts before yours so you can gauge the decisions they have made. • Identify both ends of the line. • Motor or sail directly along the line to help the bowman and helmsman to draw a mental line on the water. • After your normal pre-start procedures, wait around the middle of the line – this will allow you to switch ends if there is a major change to the conditions and won’t reveal your plans to your competitors. • Don’t rely solely on the sound signals if starting from the outer end of the line – sound takes seven seconds to reach West Bramble from the RYS cannons. • Switch your VHF radio to the correct channel early to be sure of catching the time-check announcement. • As soon as the course is announced, you will know if you are starting at the north or south end of the line. Use the engine if necessary to get to your chosen end. These four were compiled with the help of Cowes Combined Clubs and all relate to rules issues. Make sure you brush up on the rules, but take particular note of these. ‘A boat shall avoid contact with another boat if reasonably possible.’ Yacht racing is not a contact sport. But, if you keep clear too early, your protest will not stick. Overall, it’s best to sail around the infringer and get on with your race. Avoid contact at all costs to stay out of the protest room, where your chances of success are only likely to be fifty-fifty. With numerous marks and multiple headlands, at some point everyone will have to face this rule when racing in the Solent. 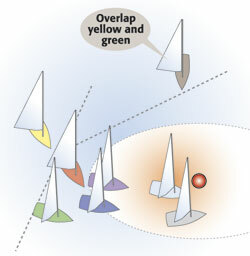 A common mistake comes with the difficulty in judging the overlap from two fleets approaching the same mark from different angles, or a large fleet stacking up trying to round a mark. the other boat room to keep clear.’ You can’t simply turn your boat into another without giving them time to avoid you. However, the windward boat be aware: you must keep clear even if the leeward boat doesn’t have rights (you can argue that later). But rights or no, as windward boat you MUST make all efforts to keep clear. It sounds quite simple – ‘port gives way to starboard’ – but, of course, each boat certainly has its own perspective on the situation, placing Rule 10 at the centre of the most common error. To understand more about the number one mistake at Cowes, see this month’s Knowledge, where John Doerr breaks down this fundamental rule.